Traditional weight loss methods (dieting), leave your body feeling like it's starving, which causes the body to go into "conservation mode". This means that your metabolism slows down and your body starts using it's energy more efficiently, making it harder for you to shed fat and pounds. When the diet is over and the weight starts creeping back on, your body will pack on a few extra pounds to store up for the next time it anticipates a famine. By contrast, Ultrasonic Cavitation doesn't cause the body to "panic", and it won't fight against you by working so hard to hold on to it's fat reserves. The fat is eliminated naturally, being processed by your body's own filtration system. 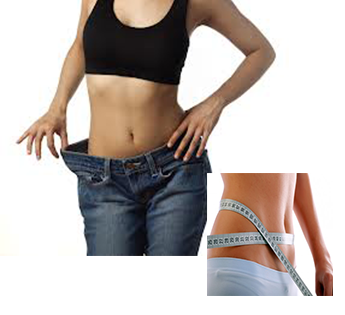 Compared to surgical methods (gastric bypass, lap band, liposuction, etc), there is no scarring, no bleeding, no risk of infection, no pain, no down-time for recovery and, in most cases, Ultrasonic Cavitation is much more affordable. Compared to fat-freezing and laser fat removal procedures, the results are more immediate and dramatic and there is absolutely no pain or down-time. 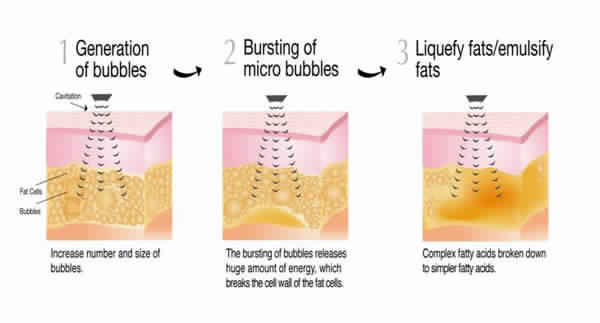 The Ultrasonic Cavitation machine uses sound waves/frequencies to disrupt the fat cell walls, which causes the fat cells to "leak" their contents into the fluid spaces of your body. From there, your lymph system picks up this waste material (the loose fat) and begins circulating it through your body until it can be processed by the liver and eliminated with sweat, urine and feces. The results are visibly noticeable immediately, however the entire process can take several days, and you will continue to experience results during this time.